Like most of the best ideas, the notion by Orla Fox and friends, to create a beautifully written and illustrated book of locally-sourced recipes came over a dinner party. This weekend, the proprietor of the charming Fox’s of Kinvara will hold a gathering to mark the first birthday of the establishment, and to launch the book which highlights the gorgeous food on offer there. 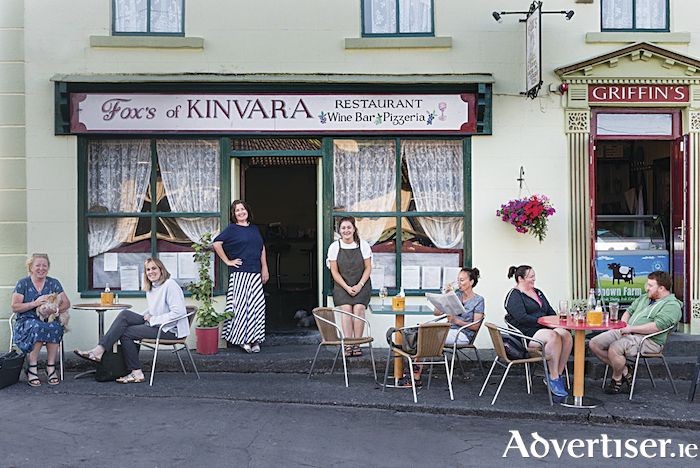 Saturday night (Sept 22 ) will see the official launch of Fox’s of Kinvara Recipes book, a collaborative project of Orla Fox, and her friends Andreas Riemenschneider and Judith Vega, both Kinvara-based photographers. “The idea to create a cook book started over a dinner party. The restaurant had just opened and there was so much excitement about cooking food that the timing and the idea of a cookbook seemed to coincide perfectly,” she told the Advertiser this week. “It has been a whirlwind of cooking, photo shoots, more cooking, tasting food, late nights, perfecting recipes, recipe writing, graphic design, a litttle bit of poetry, lots of coffee, a few glasses of wine and lots of fun,” she added. Fox’s of Kinvara has been opened for over a year in a beautiful old historic building on Main Street, Kinvara. The restaurant offers contemporary Irish cuisine and traditional Italian pizzas. Fox’s uses local and organic produce at every opportunity. Trying out new culinary ideas with the specials each day, the staff are warm and welcoming in a buzzing environment. The cookbook which retails for €25, reflects a love of food and flavour and contains some of the most popular recipes at the restaurant. Orla has had a great love for food from an early age from growing up with a grandmother who was a wonderful cook. She later expanded that knowledge from travelling around the world and picking up different food experiences in far flung places. Now after a career in med tech engineering, she has created the wonderful Fox’s, not reflecting her Mayo roots with a WIFI password that pays homage to her native football team. Judith and Andreas draw their inspiration for photography from the beautiful surroundings of Kinvara. Judith likes to photograph the wild flowers of the Burren and captures that in her food photography. Combine the three talents and you get a wonderful book which espouses the local in the culinary and the culture. The book launch party is also to celebrate all the support and encouragement of the restaurant’s customers and many new friends over the last year. Everyone is welcome on Saturday evening from 8pm.